Beyonce | Nicki Minaj | Rihanna : Are The “Holy Trinity” Rumors True? – The Social B.
Beyonce | Nicki Minaj | Rihanna : Are The “Holy Trinity” Rumors True? When a bey-hive that’s constantly buzzing, a navy that never sinks, and a dollhouse full of barbs join together one could only imagine the amount of damage these three Queens will do together. Earlier this year, rumors spread about an alleged collaboration between Beyonce, Rihanna and Nicki Minaj, but Nicki quickly put the rumors to rest. After new evidence of an alleged ASCAP image surfaced online, this rumor once again had the internet roaring. Now it’s no secret that Nicki has teamed up with both of these R&B diva’s separately. With Bey and Nicki’s recent release of the Flawless remix, and Nicki and Rih’s hit single Fly – it’s no surprise if these three produce a chart topping hit together. 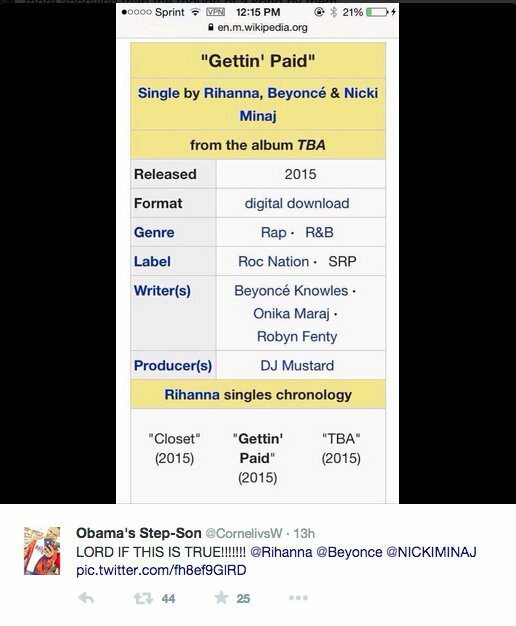 “I’ve been seeing the “Holy Trinity,” Beyonce, Rihanna, Nicki Minaj thing on Twitter and it cracks me up. They always get pictures of us in like the same color and they’ll put it together and tweet it to me, it’s so cute,” Nicki says. “I love both of those girls very much and that would be so dope for black women, especially in a time right now when black women are so scarce; we’re so copied and …..discredited. Not given our full props when we create. Hmm, if the rumors are true I am beyond excited to hear the raw talent coming from these ladies. Do you think a collaboration between the three of them would be a great way to start off the new year?